Yes, I know it's still February but while at the grocery store today I came across these cute Shamrock cookie cutters and I had to buy them. I figured, why not use them today? My husband is working and it would be fun to make these with M. I rarely make sweets anymore but I figured I'd splurge and make these cute Shamrock treats. They were so easy to make and my son had a great time decorating them. In a large saucepan melt butter over low heat. Add marshmallows and stir until completely melted. Remove from heat. Add cereal. Stir until well coated. Using buttered spatula or wax paper evenly press mixture into 13 x 9 x 2-inch pan coated with cooking spray. Cool slightly. 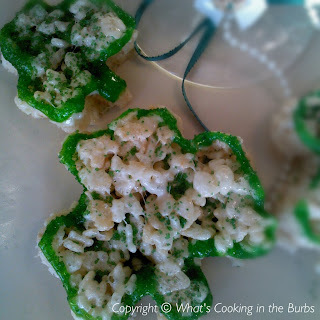 Using cookie cutter coated with cooking spray cut into shamrocks. Decorate with frosting and decorating sugar (if desired). Best if served the same day. Enjoy!